You've found your Storm home on the Web!!! Welcome to the Geo Storm Owners Page, formerly the Geo Storm Owners Club (GSOC). Please just call us StormOwners.Com. Here you will find the authoritative source for information about Geo Storm automobiles, focusing on historic, technical, and tuning information for the under appreciated, Isuzu made, Geo Storm automobile. We are happy to announce that the Autocross Preparation page and , Club Racing Preparation page are up. These pages provide a thorough rundown of vehicle classing and allowed modifications for both SCCA Solo2, NASA NasaX, SCCA Club Racing, and NASA Club Racing sanctioned autocross and road racing competition. Please visit our Tuning section is now up. The authoritative source for Geo Storm information, now has the most exhaustive information about performance tuning Geo Storms. The Tuning pages now boast expanded information on the topic of Brake System Design Theory, Component Choice, and Overall Strategy, providing a comprehensive guide to redesigning and upgrading the brake system of your Geo Storm. And please do not miss our review of JDM and USDM Tuning Shops. 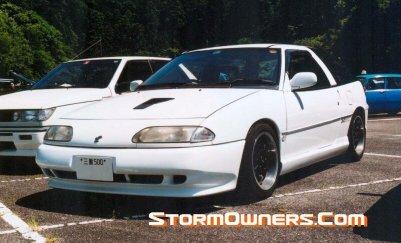 StormOwners.Com has merged with the IsuzuWeb car club, the largest Isuzu car club, thereby increasing our resources and reach, to become part of the largest Isuzu car club in the world.